Find the Ram HD at East Hills Dodge Chrysler Jeep RAM - serving Westbury, Roslyn, Bayside, Garden City, Amityville, West Islip, and beyond! 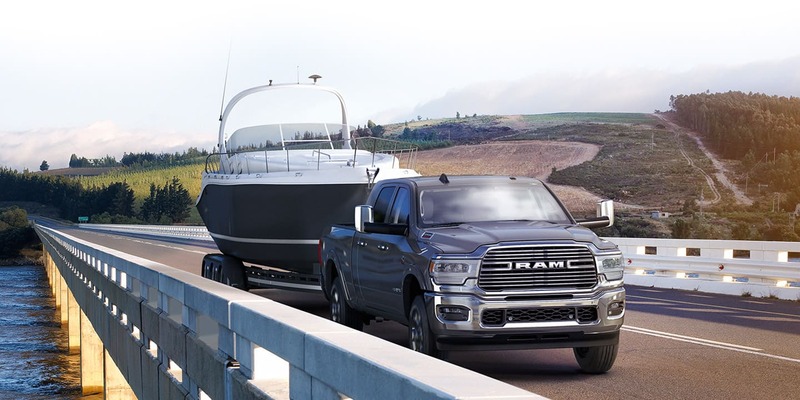 Ram has fully redesigned the Heavy Duty line to be the most capable when it comes towing and hauling payloads, delivering the most comfortable ride, and superior handling! These brand new and incredibly powerful trucks are delivering the highest capability numbers for both gas and diesel powered pickup trucks with a max towing rate of 35,100 pounds and max payload rate of 7,680 pounds. We are going over the incredible power and handling these trucks have to offer down below in detail so keep reading! The standard engine for both the 2019 Ram 2500 and 3500 Heavy Duty pickup trucks is the proven and menacing 6.4-liter Hemi V8 that generates the class-leading 410 horsepower and 429 pound-feet of torque. This engine meets all the needs of heavy-duty truck owners from towing to hauling with a TorqueFlite eight-speed automatic transmission. Also available to power the Heavy Duty Ram trucks is the all-new Cummins 6.7-liter I-6 Turbo Diesel engine. This engine pumps out up to 400 horsepower and 1,000 pound-feet of torque and comes mated to an Aisin AS69RC electronically controlled six-speed automatic. This engine's changes begin at the very center utilizing compacted graphite iron to build the cylinder block and overall it weighs 60 pounds less than previous models. A second version of this engine is available, it bumps out up to 370 horsepower and 850 pound-feet of torque and it comes mated to an enhanced version of the 68RFE six-speed automatic transmission. When it comes to towing and hauling, the Ram 2500 and 3500 Heavy-Duty trucks can do it all! 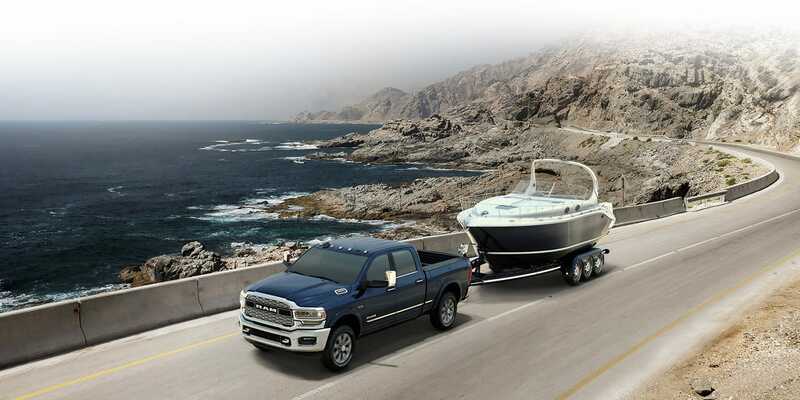 The 2500 Ram HD truck delivers up to best-in-class diesel towing capacity of 19,780 pounds. It also delivers an uncomprimising payload of up to 4,050 pounds. The 3500 models offer a best-in-class 35,100 pounds diesel towing capacity. When it comes to payload, the Ram 3500 HD model can handle loads up to 7,680 pounds -- that's the best-in-class gas payload number! Q. What are the 2019 Ram 2500 trim levels? A. There are six trim levels available for the 2019 model year and they include the Tradesman, Big Horn, Power Wagon, Laramie, Laramie Longhorn Edition, and the Limited. Q. What are the 2019 Ram 3500 trim levels? A.There are five Ram 3500 HD trim levels available for the 2019 model year. These trims include the Tradesman, Big Horn, Laramie, Laramie Longhorn Edition, and Limited. Q. What kind of suspension do the 2500 and 3500 Ram trucks utilize? A. In the front of the truck, the Ram HD models feature a two-piece, front-suspension cross member structure that adds greater strength to the frame and a longer welded interface. These trucks also utilize an advanced three-link front suspension for roll stiffness. Both HD Ram models can be outfitted with a class-exclusive Active-Level rear air suspension that offers a new bed-lowering mode so trailering hookups are a breeze! For a more comfortable ride, the 2019 Ram HD models utilize Frequency Response Damping shocks in all four corners. These shocks allow the HD models to have a more sports-car-like suspension as the shock valves automatically adjust for the type of vertical wheel input. Q. Can you tell me about the Ram HD brakes? A. Both Ram HD trucks utilize a new braking system in the 2019 model year. This braking system features enhanced calipers, master cylinder, and booster. When those features are combined with a larger-ratio pedal swing, little effort is required from the driver, the HD models now deliver more confident and powerful braking execution. This enhanced system also delivers shorter stopping distances that match the highest capabilities. Q. What kind of frame do the Ram HD models ride on? A. Both HD models are riding on all-new frames that are engineered with 98.5% high-strength steel, hydroformed main rails, six separate cross members, and fully boxed rear rails. All these components come together delivering mass efficiency and optimal strength. The Ram HD models may be more capable and stronger but that doesn't mean they have to weigh more, in fact, thanks to the use of lightweight materials, the frame weighs 143 pounds less than previous models. Q. Any 4WD configurations available? A. Yes! HD 2019 Ram models configured with 4WD are also equipped with a BorgWarner part-time transfer case. Both the V8 engine and Cummins Turbo Diesel engine can deliver power through an electronic or manual shift transfer case. HD trucks that are powered by the high-output version of the Cummins Turbo Diesel engine come equipped with a brand-new BorgWarner transfer case. This transfer case is specifically engineered to handle higher torque outputs and towing capabilities. Q. Where are the Ram 2500 and 3500 HD models built? A. All of the 2019 Ram Heavy Duty models are built at the Saltillo Truck Assembly Plant located in Coahuila, Mexico. The 2019 Ram Heavy Duty models are rolling off the production lines and heading to the dealership! If you are interested in learning even more about these trucks you can reach out to our sales team! You can also peruse our Ram HD model online inventory right here!